If you had read my earlier posts you might be aware how much I loved Faces Cosmetics. I am a huge fan of this brand due to its range and quality. 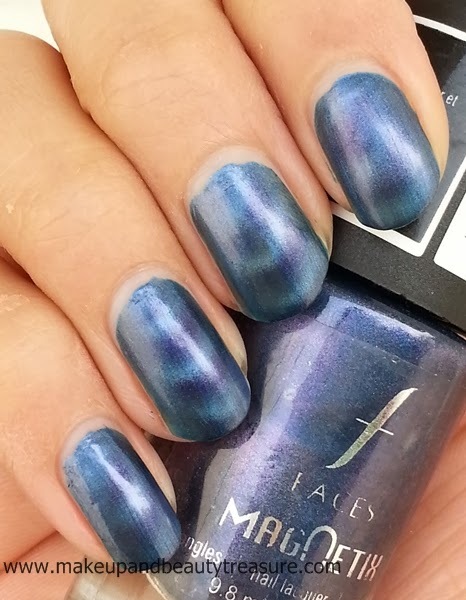 Few months back, the SA there called me up and asked me to have a look at the limited edition Magnetix Nail Polishes (It is still available everywhere. I wonder why she told me that it is limited edition!). I was really excited to see the range of colors. All were metallics with really elegant colors. I picked up blue one for myself. 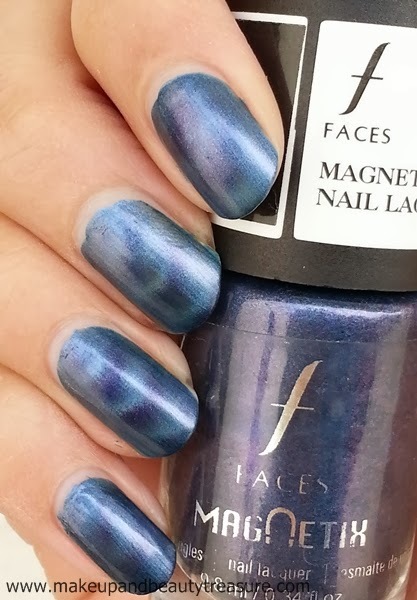 Today I am going to discuss my experience with Faces Cosmetics Magnetix Nail Lacquer in Blue color. 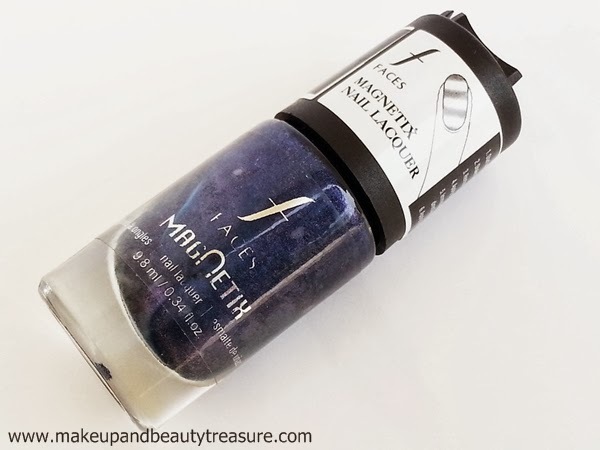 Faces Cosmetics Magnetix Nail Lacquer comes in a clear cylindrical glass bottle with a matte black screw top lid. The lid holds the brush applicator inside it. At the top of the lid, there is a small and flat magnet. The magnet lid can be pulled out and can be hovered over the nails as desired. It has a raised ridge on the lid so that you can rest it on your cuticles without smudging the nail polish. The pattern that the magnet will create is displayed on the front sticker of the lid. In my case there are horizontal patterns or waves. It also contains the instructions as to how to create the patterns. The brush of the nail paint is quite good and the bristles are soft. It applies smoothly and evenly without brushing along the skin. 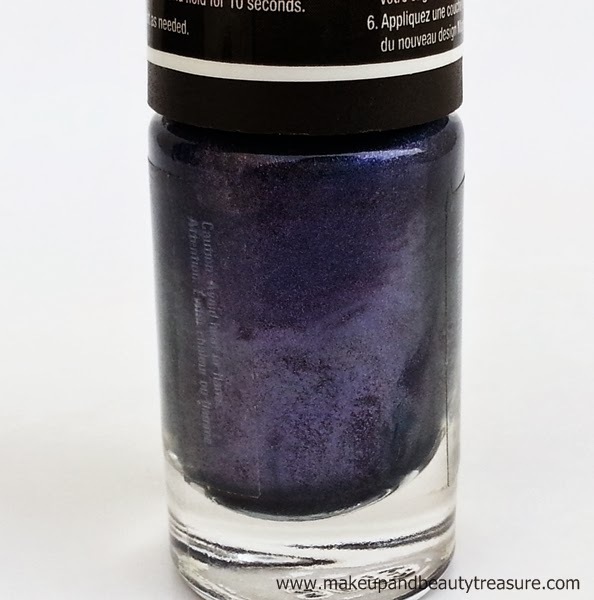 The nail lacquer can be easily carried around in a makeup bag without any fear of leakage or spillage. The formula of the nail polish is really good. It is neither very runny nor very thick. It applies smoothly over my nails without streaking. The pigmentation is just superb. It delivers good coverage in a single coat and I really do not feel the need to apply a second coat. 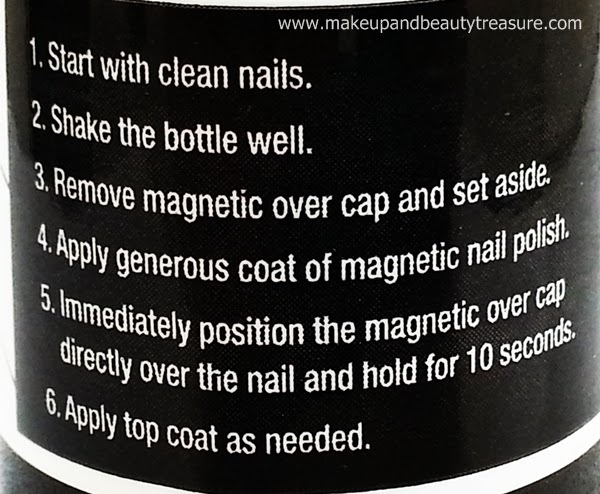 In the case of the magnetix nail polish, you need to do one nail at time so the whole process can be a bit time consuming. After applying the nail paint on a nail, immediately place the magnet against the cuticle and hold it for about 10-15 seconds. Make sure that you do it quickly as the magnetizing process won’t work on dry nails. As soon as you take away the magnet from your nails, you will get horizontal magnetic patterns over your nails. 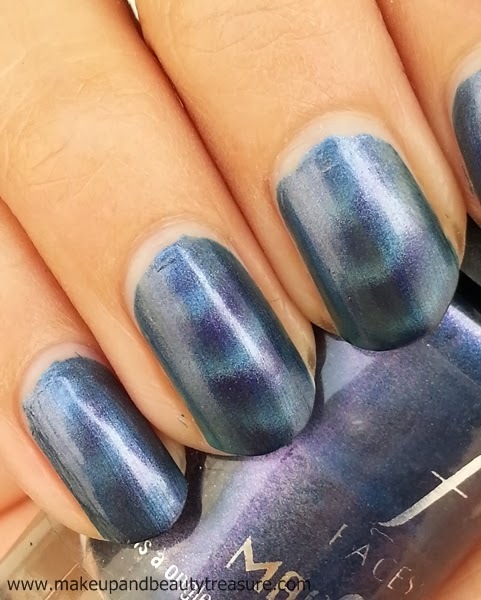 The waves were not as obvious as on the bottle but I love the soft effect they give to my nails. It creates wavy patterns in two shades of blue making it two tone manicure. 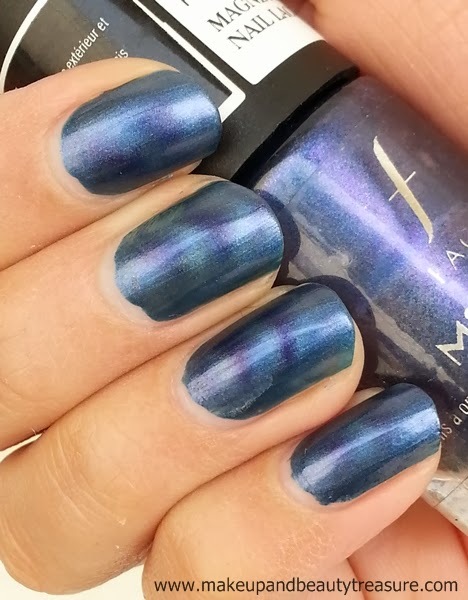 The metallic finish gives my nails an elegant look. At first I could see the patterns were not created at the sides of the nails so for another nail I slightly moved the magnet across the nail to get the whole effect. I loved how it creates two shades of blue with darker on the stripes. It gives a slight 3D effect to my nails. The nail polish lasts for a good 3-4 days without chipping. It is easy to remove and does not stain my nails. I really got so many compliments from my friends as the effects are really gorgeous. 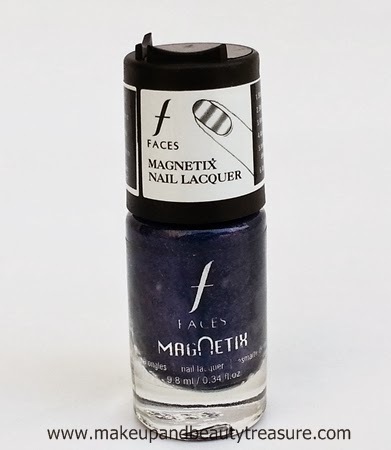 Faces Cosmetics Magnetix Nail Lacquer comes in many colors and 2 patterns- horizontal and diagonal. • Gives a slight 3D effect. • Great colors to choose from. • Can be a bit tricky process when used for the first time. 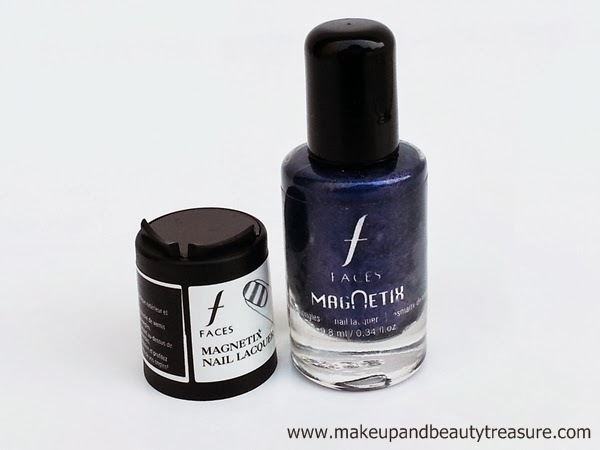 Overall I am really pleased with Faces Cosmetics Magnetix Nail Lacquer. It is a great alternative to nail arts. It creates beautiful horizontal wavy patterns within seconds and gives your nails a striking effect. It is of good quality and looks lovely on nails. I would definitely recommend it if you are fond of trying new things on your nails. 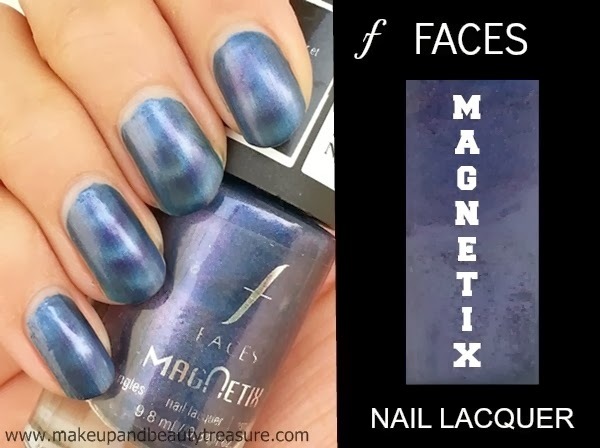 Have you tried Faces Cosmetics Magnetix Nail Lacquer? How was your experience? Share in the comments section below!